PARK HILL, Okla. — The George M. Murrell Home Historic Site, just south of Tahlequah, will be hosting our annual Antique Agriculture Festival on October 6–8, 2017. 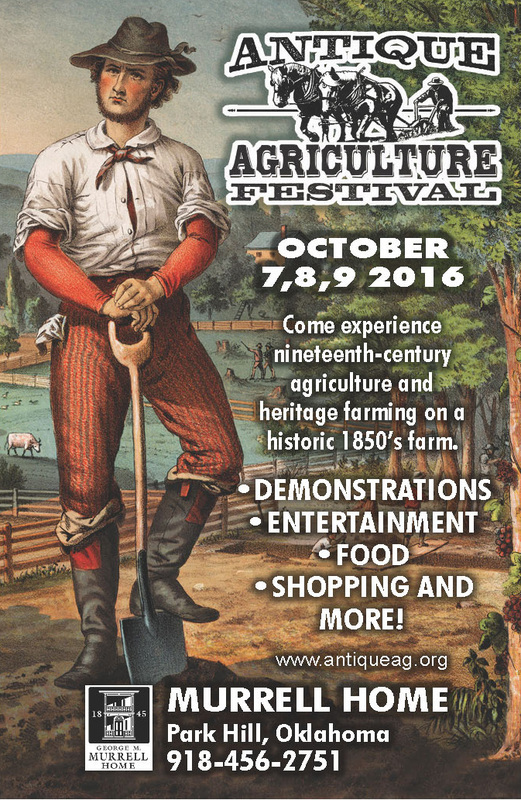 The festival will feature 19th-century agricultural practices sure to provide fun activities for the whole family. The three-day event includes ongoing living history demonstrations, entertainment, shopping and food vendors. The Murrell Home, built in 1845, is the last remaining 19th-century plantation in Oklahoma. Visitors are invited to watch demonstrations and participate in hands-on activities over a variety of topics including foodways, domestic skills, trades, animal husbandry and farming. “All of the activities will be performed in the 19th-century manner,” said Fowler. Admission to the event is $7.00 for adults and $4.00 for students age 6-18. Children 5 and under are free. For more information on the festival, visit www.antiqueag.org or contact the Murrell Home at 918-456-2751. The historic site is located at 19479 E. Murrell Home Road in Park Hill, Okla. The George M. Murrell Home is a division of the Oklahoma Historical Society. The mission of the Oklahoma Historical Society is to collect, preserve and share the history and culture of the state of Oklahoma. Founded in 1893 by members of the Territorial Press Association, the OHS maintains museums, historic sites and affiliates across the state. Through its research archives, exhibits, educational programs and publications the OHS chronicles the rich history of Oklahoma. For more information about the OHS, please visit www.okhistory.org. If you are a member of the media and would like to be including on our list for press releases, please email murrellhome@okhistory.org with your contact information.